No posts for nine months here is pretty poor. Sorry to have slid off the blog wagon. 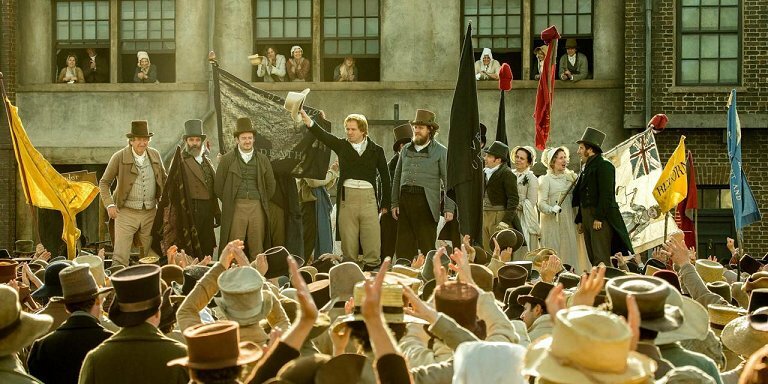 As I clamber awkwardly back on, let’s join in the applause for Mike Leigh’s acclaimed film of Peterloo. If you haven’t seen it, do so, if possible on the big screen. Be prepared for a couple of hours of wonderful period oratory, as Leigh builds the arguments on either side, moving towards his climactic, seat-gripping and astonishing reconstruction of the mass meeting at St Peter’s Fields. Here the Hussars come out of it relatively well, one officer at least urging restraint. 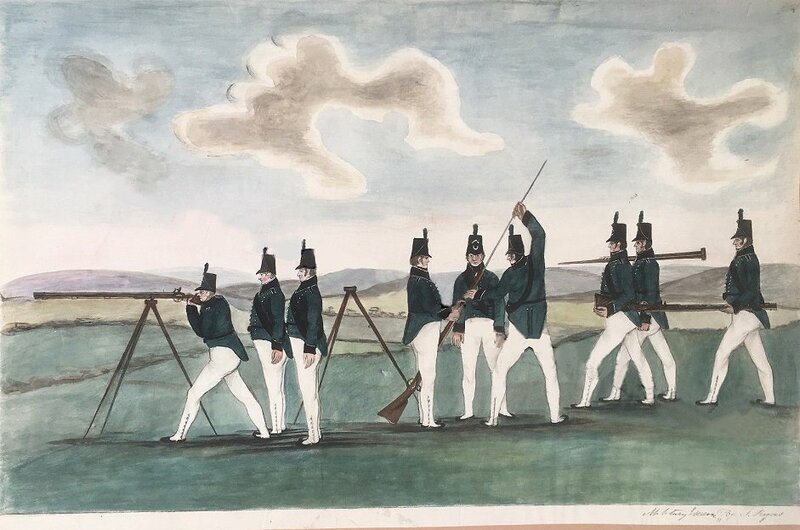 (Though the infantry look a bit Peninsular for 1819, surely?) But the Manchester and Salford Yeomanry are played as oafish John Bulls, amateurs without discipline. Which could be a fair picture, given the number of unarmed civilians they managed to sabre. I suppose this is what happens when the focus of auxiliary forces moves from defence against invasion to the maintenance of internal “order”. In the film the Yeomanry wear the light dragoon outfit of the period, as shown in the well known Richard Carlile print of the massacre; since Carlile was on the platform during the mayhem, we can take that as accurate enough. These three troops were raised fresh in 1817, and were disbanded within five years. Not too much continuity then with their predecessors, the Manchester and Salford Light Horse Volunteers, raised in 1797, reformed in 1803 and apparently disbanded in 1809. This seems like a good opportunity to take a quick look at them. Every Volunteer at his own expence to furnish himself with the following cloathing, arms & accoutrements, all made to pattern: a regimental bridle and saddle, with cloak-pad, and straps; a cartouch box, containing four rounds, fixed on the outside of each holster; a sabre, a buff leather sword knot whited, a black spanish leather waist belt, a pistol, a regimental blue coat-cloak, with white collar and lining; a dress uniform … and an undress … ; each Commissioned Officer to procure a crimson silk sash. The Dress Uniform is a blue hussar Jacket, with silver lace, white collar and cuffs; white quilted waistcoat, white leather breeches, long black topped boots, plated spurs with horizontal rowels, black velvet stock, with a narrow white turn-over; frilled shirt, hair well powdered, short sides, queue tied close to the head; silk rosette, white wash leather gloves, and helmet with long white feather. Further details follow for farriers, trumpeters and “Serjeants in Pay”. 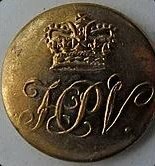 For off duty wear, “such gentlemen as chuse it” could wear a blue undress coat with black velvet facings and regimental buttons, which on this coat were to be flat and gilt, with the raised letters “L.H.V.” By 1798 silver chain wings had been added to the dress jacket, and scale wings to the undress. Despite such enthusiasm, within a few years these remaining two troops had disbanded, and Manchester had to manage without its yeomanry, until post-war discontent prompted a darker chapter.